Dr. Vogel helped Maya attain a fresher look for her new career. 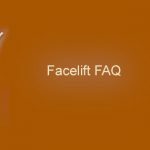 When performing facelift, Dr. Vogel strives for a natural-looking result. Browlift and eyelid contouring can enhance the upper third of the face. Dr. Vogel discusses his approach to facial rejuvenation.